Reached one of the point levels shown below? Send us proof and collect some seriously awesome prizes today! How to earn points on TopYa! 3. 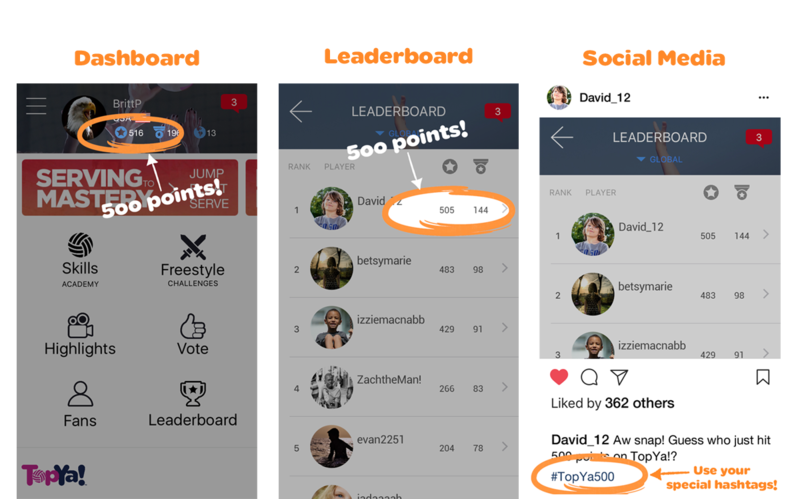 Tag @TopYaSports and post your screenshots to Instagram, Facebook or Twitter using your point level’s special hashtag for a chance to be featured or win bonus prizes! 250 Earn 250 points to receive a TopYa! PopSocket. Post a video to Instagram, Facebook or Twitter using hashtag #TopYa250 for a chance to be featured! 500 Earn 500 points to receive a TopYa! Pod tripod to hold your device or camera! Share your screenshot to Instagram, Facebook or Twitter using hashtag #TopYa500 to receive a deluxe Bluetooth™ capable TopYa! Pod! 750 Earn 750 points to receive a TopYa! hat. Post a video to Instagram, Facebook or Twitter using hashtag #TopYa750 for a chance to be featured! 1,000 Earn 1,000 points to receive an exclusive TopYa! 1k t-shirt! Post video to Instagram, Facebook or Twitter using hashtag #TopYa1k for a chance to be featured! 1,500 Earn 1,500 points to receive an exclusive TopYa! hoodie. Post a video to Instagram, Facebook or Twitter using hashtag #TopYa1500 for a chance to be featured! 2,000 Reach 2,000 points to receive a custom TopYa! Highlight Reel video of your best Skills and Freestyles! Post video to Instagram, Facebook or Twitter using hashtag #TopYa2k for a chance to be featured!